S07E06 - "Beyond the Wall"
Game of Thrones' penultimate episodes come with both a warning and an expectation. We go into them with a sense of uneasiness as the series' history has a proven track record for doing some pretty harrowing things in each of its episode nine's, but we also expect a certain level of quality to them. Four of the show's previous six seasons peak in their penultimate episodes, which means that "Beyond the Wall" comes with a heavy burden. This is the first penultimate episode that isn't an episode nine, and it's coming at the back of the show's shortest season to date. The odds were stacked against "Beyond the Wall" and, truth be told, I'm not entirely sure how much of it manages to succeed. There's a lot of terrific stuff buried in this episode - some of it on surface level, some a bit more disguised - but it's flat out impossible to ignore how rushed this episode's storytelling is, and not just in terms of this singular 70-minute chunk of television. "Beyond the Wall" seems to act as a feature length highlight of both season seven's very best attributes and its very worst flaws, creating the show's most uneven penultimate episode so far - and, regrettably, the only one I wouldn't slap a 10 score at the bottom of. As it has been throughout the season, Sansa and Arya's plot here is woefully misguided. Last week I expressed excitement that the show found a conflict between the pair, I thought finally these characters would be given time to grow around each other again. Instead, however, "Beyond the Wall" throws them head on into a pair of clunky arguments that don't really say a lot. Arya chastises Sansa for the letter she wrote years ago, and Sansa (justifiably) defends her actions as the doings of a young, scared, manipulated child. Arya's having none of it though, and leaves. They don't talk things through, they don't look at the bigger picture around them - despite literally everyone going on about it all the time - and try to understand each other. Arya just walks out. When we return to them at the end of the episode things just get even worse. In what might wind up as one of Game of Thrones worst dialogue pieces to date, Sansa confronts Arya about her bag of faces from Braavos, and Arya replies in riddle. For literally no reason. It's a terrible, horribly written sequence, and one that finds the usually reliable Maisie Williams wildly out of her depth. Arya's words here make little sense, merely rambling on about what shes been through before genuinely threatening to kill Sansa. And...why? I'm aware that I sound hypocritical when last week I wanted conflict and now that it's here I'm tearing it apart, but what's happening here isn't good writing. Why are Sansa and Arya incapable of having a normal conversation? Perhaps this is being so drawn out to fill in the gaps left now that everyone's stopped talking about Jon Snow's true heritage. Bran learned the truth at the end of season six, and has told no one. Again, why? Even among its most momentous season to date, Game of Thrones is still stalling something we've all kind of known since about season two. It's deeply frustrating to watch, especially given how this is the season in which it matters the most. Jon himself finding out now might not work, granted, but there's no reason these talks can't surface in Winterfell, it would actually benefit the Stark children a lot. Real conflict rooted in something that they're all experiencing together, not just two sisters arguing over something they're not even capable of talking about normally. The episode does improve when we head beyond the Wall, but it's still tough to silence the worries of overly hasty storytelling. While the little paired up dialogue scenes between various members of the guys on this mission are appreciated - it's nice to see two people having a normal conversation isn't it, Arya and Sansa - they don't really do well enough to disguise the fact that this is a bit of a rushed mission. Once things eventually do go awry, and Jon and his mini army are stranded on an ice island surrounded by thousands on Wights, it's difficult not to be overwhelmed by how poorly conceived this whole storyline is. "Hardhome" was, what, two seasons ago? Has Jon forgotten about that already? Jon has spent the whole season rambling about the dangers beyond the Wall, and now him and nine merry men just start gallivanting around up there like they're on a field trip. There's little sense of strategy to their plan, no real sense of danger until it's too late. The sweeping overhead shots do well to enforce their isolation out there, but no one actually involved in the scene seems to have any thoughts about what they're doing and whether or not it's a good plan. Game of Thrones was once a show that prided itself on strategy, on telling intricate stories in clever, nuanced ways. Season seven's shorter runtime has sacrificed this, throwing a handful of characters North of the Wall just because the plot needs them to be there for a while. Eventually the Wights all start attacking but luckily Gendry ran off back to Eastwatch and sent a raven to Daenerys first, so she comes swooping in with her dragons to save the day. It's a well produced scene, benefiting perhaps more than it should from the sheer thrill of seeing Dany and her dragons beyond the Wall. 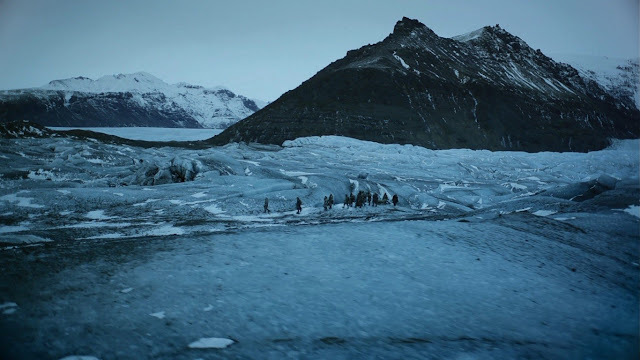 The action is crisp and cleanly cut but the ferociousness of the battle still lands, director Alan Taylor uses the contrasting colours of the fire and the ice to create a stark visual palette unlike any battle Game of Thrones has done before. There's little at stake with such a forgettable roster of characters, but Taylor finds countless individual moments within the battle for it to still launch itself to the upper echelon of the show's battle rankings. It's heartstoppingly intense, and it looks incredible. It eventually all culminates in Daenerys losing a dragon and having to flee without Jon, but Jon is then saved by good old Uncle Benjen who spontaneously sacrifices himself to let Jon live. After such a strongly directed battle sequence it's frustrating that the episode ends it all so suddenly, and Benjen's surprise reappearance borders on laughable in just how contrived it is. Presuming it was Viserion that died in the battle, could Rhaegal not have popped back and saved Jon? Something a bit more in-keeping with the episode we've been watching for 65 minutes, and more intact with the whole "Jon is a true Targaryen" thing we learned last week. Again, it feels rushed and doesn't really make a whole lot of sense, something Game of Thrones has indulged in a lot this season. "Beyond the Wall" is an episode made up of big moments, but its one that unfortunately diminishes its characters to make these big moments happen. Jon's complete lack of any real plan for this mission is an irredeemable mistake on the show's behalf, instead choosing to mask the shaky mechanics with icy dragon spectacle. There's an undeniable thrill to seeing the dragon's eye reopen in the final shot, with the Night King now more armed than ever, but was the journey there too uneven and poorly conceived for the moment to land with the horror and excitement it really deserved? I'm thinking so. I've seen some people argue that the whole plan makes no sense anyway, but I wouldn't stretch that far. Cersei is a raving lunatic, granted, but even she couldn't ignore an actual Wight if it stood before her. I'm not saying Jon needed to ride the dragon back to Eastwatch, it could have carried him maybe, or Rhaegal could've thrown Jon's unconscious body onto his back and flown off. I appreciate that the show doesn't want to reveal the Targaryen heritage to Jon and Dany just yet, and that makes perfect sense, but Benjen popping back for thirty seconds was so spontaneous and out of nowhere that the whole climax just falls apart. Also, anyone else think it's strange that they don't tell us which dragon died? I'm pretty sure it was Viserion, but the episode seems to hide it from us. Very odd. I really enjoyed Jon and Dany's final scene together. A conversation of sacrifice and new understanding, with both parties subtly acknowledging their own mistakes and relating it to the other. Emilia Clarke's delivery of "I hope I deserve it" might be her strongest acting work on this show yet. Daenerys looked like she could've burst into tears at any moment, part of me even thought she was going to. Stunning work from Clarke, once again. Although Jon calling her "Dany" was an awful horrible moment and I'm already frustrated that they're pulling these two away from a platonic relationship. Why, show? Why? If Arya dies in next week's finale I would be over the moon. This show has taken one of its all time great characters and turned her into a walking barrage of nonsense and idiocy. She won't though. Littlefinger probably will, but she won't. Damn it. Regarding the final Arya and Sansa scene. Arya wasn't threatening to kill her, it was all a lie as she told Sansa at the beginning that they were playing the game of faces and then finally handing the knife to Sansa was to affirm to her that she would never betray her family. I understand what the scene is going for, but it still comes across as Arya making a threat. Sansa doesn't know the game of faces, and Arya is acting entirely out of character - Sansa visibly looks and feels threatened in that scene, regardless of Arya's intentions.